Salt & pepper Butter/Oil mix – about a teaspoon of each to cook the fritters in. 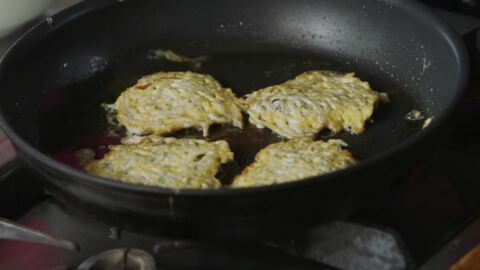 Add more when needed between cooking fritter batches. 1. Whisk egg and yolk together. 3. Heat some of the butter/oil mix in the pan and cook in spoonfuls, adding more butter/oil mix between batches as required. 4. Serve with fresh white bread and olive oil or lashings of butter.